Lenovo owned Motorola has been dormant for a few months in the smartphone market and has not made any significant release in the recent past. However, the brand finally broke its streak by making a significant launch of its Moto G7 series at an event in Brazil. The smartphones which were launched in this line-up are the Moto G7, Moto G7 Plus, Moto G7 Play and the Moto G7 Power. The new line-up also comes with features like full-day battery life, improved camera performance and more. Like we mentioned above, this launch comes at a very crucial time as Motorola seems to be lagging behind other manufacturers like Huawei, Xiaomi, Samsung and more. Currently, the phones have been launched for the Brazilian market, and the other markets like India, USA, and Canada are expected to follow next. The launch of the Moto G7 series is also significant for the Lenovo owned brand because it is one of the first launches of this year. Further, the phones have been launched before the Mobile World Congress 2019, where brands from across the world will be coming along to show their latest and most innovative smartphone offerings. The South Korean giant, Samsung has also made its budget and mid-range segment debuts this year with India as its launch market. These phones were the Samsung Galaxy M10 and Galaxy M20, and they come with an affordable price tag thus making them the perfect contender against Moto’s G7 line-up. The Moto G7 boasts of a 6.24-inch Full HD+ screen which means a resolution of 1080×2270 pixels on a Max Vision display. Under the hood, the Moto G7 will be powered by the by octa-core Qualcomm Snapdragon 632 SoC clocking a frequency of 1.8GHz. The smartphone also boasts of 4GB of RAM, 64GB of inbuilt storage, and microSD card slot allowing users to expand memory till 128GB. The battery on this device will be a 3000mAh pack. About camera and imaging, the Moto G7 will sport a 12MP primary sensor with an f/1.8 lens and 5MP secondary sensor with an f/2.2 lens. There is also an 8MP sensor with an f/2.2 aperture lens on the front side for selfies and video calling. The Moto G7 Plus is the higher variant of the standard Moto G7 debut, but it sports the same 6.24-inch Full HD+ Max Vision screen which has a resolution of 1080×2270 pixels, but on the inside the Moto G7 Plus features the Qualcomm’s Snapdragon 636 SoC clocking 1.8GHz and accompanying this setup is 4GB of RAM. The inbuilt storage on this phone is 64GB which is expandable via microSD card slot up to 512GB. The dual camera setup on the rear side of this device consists of a 16MP sensor with an f/1.7 lens and a 5MP secondary sensor with an f/2.2 lens. The rear dual camera setup also boasts of having OIS. On the front, the Moto G7 has a 12MP sensor with an f/2.0 lens. The battery on this device is also a 3000mAh one. The Moto G7 Power is easily differentiable between the other two phones as it sports a slightly smaller 6.2-inch screen and it features HD+ resolution of 720×1520 pixels. Rest of the things aside, one area where the Moto G7 truly shines is the stamina and power as it comes with a 5000mAh battery, which according to company’s claims will last the users up to 55 hours. The phone also comes with 32GB of inbuilt storage with 3GB of RAM and paired with it is the octa-core Qualcomm Snapdragon 632 SoC clocked at 1.8GHz. When it comes to cameras, the Moto G7 Power comes with a 12MP single sensor on the rear side with an f/2.0 lens and an 8MP selfie shooter with an f/2.2 lens. Like its previous releases, the Moto G7 Play is the most affordable of all the all G7s, and it sports a 5.7-inch Max Vision screen with HD+ (720×1512 pixels) resolution. The Moto G7 Play rocks the Qualcomm’s Snapdragon 632 SoC with 1.8GHz clock speed, and it pairs with 2GB RAM. The inbuilt storage on this phone is 32GB but also expandable via microSD card up to 128GB. Under the hood, the Moto G7 also sports a 3000mAh battery. Speaking of the cameras, the Moto G7 sports a 13MP camera with an f/2.0 lens and an 8MP sensor with an f/2.2 lens on the front. 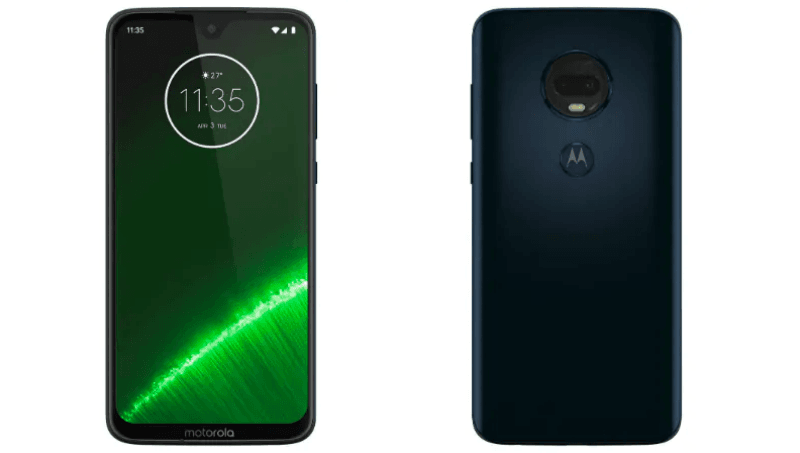 Motorola has also revealed the international pricing of the smartphones and announced that the Moto G7 would retail for $299 (roughly Rs 21,300), whereas the Moto G7 Plus will be available for a price tag of EUR 299.99 (approximately Rs 24,500). The Moto G7 Power will be available for $249 (roughly Rs 17,800) and Moto G7 Play, the most affordable of all will be available for $199 (around Rs 14,200). All the four Moto phones will go on sale in Brazil and Mexico starting today and will be launched in other markets in mid-February. There has been no confirmation from Motorola about the India launch of these phones.